This neorealist masterpiece by Vittorio De Sica follows an elderly pensioner as he strives to make ends meet during Italy’s postwar economic recovery. 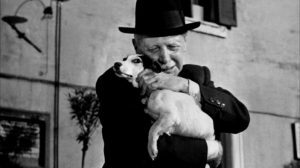 Alone except for his dog, Flike, Umberto struggles to maintain his dignity in a city where human kindness seems to have been swallowed up by the forces of modernization. His simple quest to satisfy his basic needs—food, shelter, companionship—makes for one of the most heartbreaking stories ever filmed, and an essential classic of world cinema.